Hello, we’re at the St. Louis airport and getting ready to board. 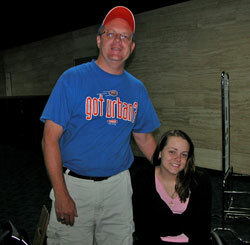 This is me with my oldest daughter, Chelsea. She’s going to Naples where I’ll drop her off and then head up to Sarasota for the weekend. We talked our gate agent into taking a quick picture. This picture just showed up in my in box. This is coming to you from the St. Louis airport, before boarding for Florida. 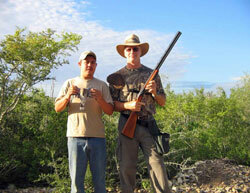 It looks like Tom Paulk, the hunter of tweety birds in Texas. What kind of birds are those Tom? I guess we’ll get to hear the stories in just a little while now. Here’s a now and then with Robert Thompson. All I can say is, “wow” Robert. You’re looking relaxed. On the Reunion Website Robert says, “It was fun to look through your now and then photo’s. Most of you look better now!” Yeah Robert, same at you buddy! I graduated from FSU in 1982 and have since traveled to over 40 countries, living in Denmark the last 20 years. Have a great reunion- and “let the good times roll” If you get the time, drop by my brothers new restaurant, “Mattisons Siesta Grille” just off stickney point bridge on the key. Since no one is sending me pictures I’ve had to go trolling on the Reunion Website. Here’s Gary Antonellis back then. Gary and I go way back, back into the early, early years. Here’s Gary and family today. After Riverview we went to U of F and had the joy of living together in the dorms and then an off-campus house. I remember most of it. How about you Gary? Some things probably should be forgotten but we have a lot of memories that are really good too. I hope to see you and Fran there! If you would like to try to organize an informal gathering like this, please let me know so I can post it if you want. Also heard from Mike Amos who says he’s coming to the reunion. 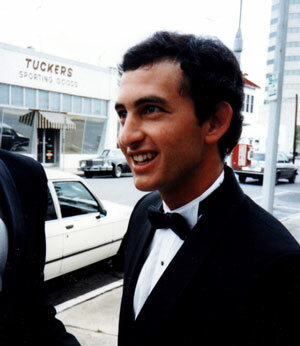 This is Danny Michaels, looking sharp in his tuxedo, taken in 1984 at our (Mary Early & my) wedding at First Methodist church in downtown Sarasota. Historians among us will also morn the loss of Tuckers store (shown in the background), which I used to love going to as a boy. I remember buying my Riverview Varsity Letter Jacket at Tuckers. Truth be told, now this goes way back, I remember buying my Cub Scout uniform at Tuckers as well. It was a great old small-town institution that sadly represents the growing trend of big/new pushing out the small/ old retailers. John’s got a great idea that I have no idea what to do with at the moment. But that’s because it’s been a long day and we just finished some apple wood smoked pork steaks, baked potato with sour cream and fresh chopped homegrown chives, etc. Now it’s time to sip a glass of wine and, well, quit blogging. How about we do a 1976 top 40 count down to number one. At 5 minutes a song that would be 3.5 hours. If you think this is good Idea. Here is a link to the top 40 hits in order. How do we do this and when/where and does someone want to volunteer to get all these songs? I’m pretty sure they can all be found and loaded onto an iPod. Finally. A picture of our fearless reunion leader. I knew she could do it. This now and then with Nancy Tatom includes what she has posted on the reunion website. Back in May of 2005 I volunteered to chair the reunion planning committee, and it has been a wonderful way of getting reacquainted with everyone and having some fun as well. I encourage all of you to help out if you can. Just let us know and we’ll definitely give you something to do as things move along! 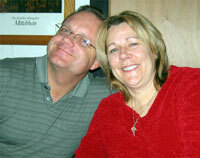 I moved back to Florida in 2004 after having lived and worked in the Carolinas for 21 years. After my daughter’s graduation from high school, I moved to Tampa, but in December of 2005 I took a position in Sarasota and have just moved back. I have one daughter (age 20) who is in her sophomore year at Rhodes College in Memphis. She is the spitting image of her mother except for her height (she was lucky enough to inherit genes that have put her height several inches above my 5′-0″ frame). She is my greatest achievement and is lots of fun to be with. I graduated from FSU with degrees in Art History and Interior Design and have worked primarily in the commercial and healthcare realms of interior design. I now work with Hoyt Architects in Sarasota and am really happy to be back in familiar territory. All of us on the committee are expecting to put on a great series of events in October, and I look forward to seeing all of you again! This now and then with Vickie Oldham is being brought to you by Charles Curry who emailed me the details. I’m sure Vickie will appreciate this Charles. 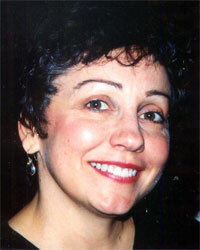 After leaving Riverview, Vickie attended the University of Florida, where she earned a bachelorâ€™s degree in broadcast journalism. She would later receive a master of fine arts at the Florida State University Conservatory of Motion Picture, Television and Recording Arts. After returning to Sarasota, Vickie made her mark as an ABC affiliate news reporter. She also hosted a popular weekly program called COMMON GROUND that featured interviews with 100 of the country’s most recognized African Americans in politics, arts and entertainment. Nationally, Vickie has appeared on network and cable television programs; and numerous television commercials and industrial videos. In February, I got a chance to see what Vickie O’s been up to. She invited me to a web site launch and the screening of a documentary she produced and wrote called LOOKING FOR ANGOLA. (www.lookingforangola.com). It was a captivating event, and the Asolo Theater in Sarasota was packed. There was lots of pre-ceremony pomp, crackle, and pop as a multi-cultural crowd filled the lobby. Miss O. was poised, stylish, and personable while greeting guests. The paparazzi snapped lots of photos. The only thing missing was the â€œred carpetâ€. Reps from the History Channel came to present a $10,000 check to the project. There were lots of local luminaries in the crowd; including the Tampa PBS station manager, and a US Park Service director. I was also delighted to see another RHS alum, Cynthia (Gaines) Myers. There’s more to this Angola project, especially when a discovery is made…stay tuned. Vickie O is on it! Since he emailed me and since his “now” pic is on the reunion website. . .
Ladies and gentelmen. It’s Scott Lewis. I am still in Sarasota, left for a while, came back for eldercare–fullfilled that and built a solid foundation to retire on. If I can help anywhere, feel free to let me know what I can do. I own a recruiting agency and work with about 10-15 restaurants in this area. I am sure Nancy will find something for you to do Scott. 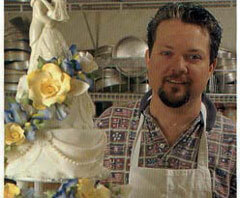 Thanks to Sue (Farrington) Obenauer I now know that Ron Zammit is a wedding cake genius creator. Seriously. As his website says: “For 24 years, Ron Zammit replaced his worn heels and soles at his shoe repair store in Gold Tree Plaza. To relax after work, he baked cakes – gorgeous cakes decorated with beautiful hand-made sugar paste flowers. Soon, friends and relatives started asking him to make special occasion cakes, until he was making about two or three cakes a weekend. It’s about time someone sent in their “now” picture. This time it’s Kim Kimble (Lamrouex). One of the comments that got lost in our server move was this one from John O’Keefe. I just happened to find it in my email. I hope we didn’t lose too many more. In reference to the post on “What songs would you like to hear? i think we should pick a song that reflects the change of the times. i believe the songs listed are songs that did a few things – they charged a generation to move past the comfort zone and they are still seen today as songs that changed the face of music. well, to me it was simply a place i spent two years before it was over – and to me it is a building, nothing more. if the building is old and falling down, build something new. as i have been reading this blog i have been trying to remember names and faces at my time at rhs, but nothing comes to mind [i was the “guy from new york with long hair] – memories are not made by a building, but by the people we know and connect with. take down the building, and build a new – let new memories be made in connection for a new generation. who knows, maybe their memories will be better. We had a great conversation. She and her husband live in Kansas City, MO which is just about 2 1/2 hours from my house and a city I’m driving through all the time. You can get caught up with her on our reunion website. She and her husband are in the organic soap business. You can find that on the web at Pearly Gates Organic Soapery. Nancy is hoping to attend our reunion just like I hope everyone will that can. This is not George Abbot, who is pictured on page 33 of the 1976 Tartan (yearbook). It is, of course, the distinguished Charles Curry. I hope we get to see you and maybe play a round of golf.
. . . I didn’t see Mr.Yost’s name on the list (she’s speaking of this post & comments), however I see Mr. Crew and not the chorus director??!? Wassup with dat!??? HAH! I just spoke to David West a couple days ago and asked him if anyone was going to invite the teachers we liked and he said he thought maybe so– so i’m seeing the blurb on the reunion website but wondering is someone trying to contact these folks? I’m thinkin Mr. Yost was in his 30’s — he’d be around 60 something i’m thinkin now.. and still in town? where would he go?? HAH! It sounds like it’s gonna be a fun reunion! Will be looking forward to seeing everyone again! the website looks great! Thanks for taking charge here and keep us posted! Here’s one way for me to keep you “posted” Sue. Thanks. I don’t have a now picture of Pam yet but she did send in an email I’ll share. You have done a great job getting this all set up! I have really enjoyed looking at everyone’s photos. I will get it togther and promise to post something to my portion. Look forward to seeing everyone in October! I think she means the reunion website (Bennie has done an awesome job).